If you are interested in adding some much needed shade to your Arizona back yard, there are plenty of options to choose from. 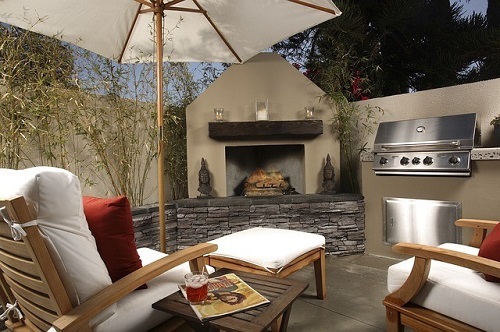 The best backyard shade ideas can range from beautifully simplistic DIY solutions to elaborate and decorative construction projects. Depending on your budget and aesthetic interests, a variety of backyard shade ideas can turn any sweltering porch into a luxurious, relaxing environment. Take a few moments to review just a few of the many popular backyard shade ideas for homeowners in Arizona and across the nation. Sometimes the best backyard shade ideas happen to be the most simple and affordable. For many Arizona homeowners especially, high quality shade sail fabrics is the solution of choice. The best shade sail fabrics are comprised of premium materials that will easily shed water, resist rotting and block harmful UV rays. If you are considering investing in shade sail fabric, ensure the product has been sintered (also called heat-set) to prevent shrinkage of the fabric over time. Thoroughly researching shade sail fabrics before buying is always recommended. Retractable awnings are often the best choice for homeowners who would like to shade a smaller area of backyard or patio. Retractable awnings are typically built from acrylic fabric and are available in either motorized or hand cranked models. One advantage that retractable awnings have in comparison to other backyard shading ideas is the ability to be quickly put away in the event of severe weather or when shade is not needed. This option may be especially perfect for homeowners who have a swimming pool or like to enjoy an occasional Sunday barbeque with family. Are you interested in backyard shade ideas that can completely transform your backyard into an inspiring and tranquil paradise? Pergolas and pavilions are always an excellent choice. Available in a myriad of styles, these structures are excellent at providing a well-shaded sitting area for friends or loved ones. A pergola, also known as an arbor, is built from a lattice which is held in place by support beams. Many homeowners allow vines to grow through the lattice to create a natural and intoxicating shade for the patio or backyard area. Although the Arizona climate may not be conducive for the growth of many plants, incorporating shade sail fabrics into a pergola's lattice may be an attractive option. By far, however, the best backyard shading option for many tends to be a pavilion. This free standing structure may be one of the more expensive options but its durability and impressive appearance more than pays for itself. Pavilions may be constructed from wood, high quality sail fabric, or a combination of both. However, some pavilions can be found through select retailers that can be easily put together much like a camping tent. Finally, make sure your grass lawn receives enough sunlight so as to promote healthy sod growth. No sod can tolerate 100% shade, so keep this in mind when creating shady areas in your backyard. Get the most out of your backyard by providing a comfortable environment for friends, family and household pets to enjoy. Don't let the unforgiving Arizona sun keep you indoors all summer long. Instead, consider creating one of these excellent backyard shade solutions and turn your backyard into your own private getaway.